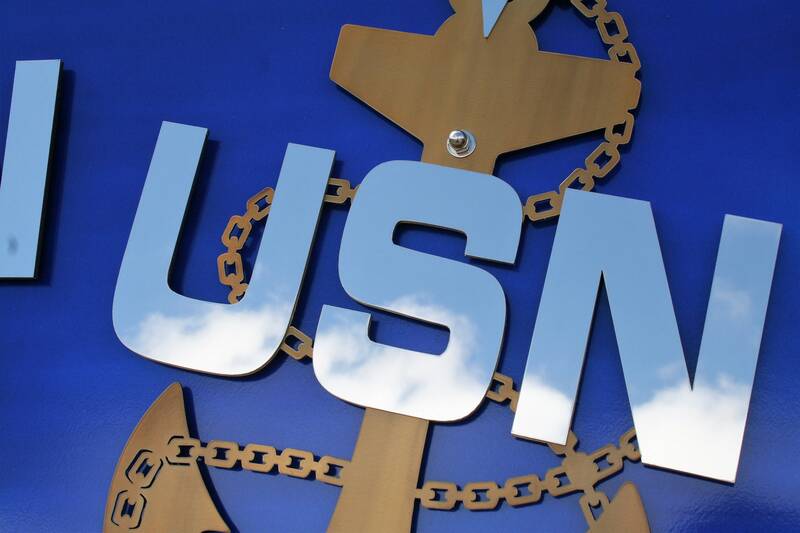 US Navy Chief's Anchor stainless steel wall decor is a stunning tribute for any Chief. Polished stainless steel dances in the light! Walk past the plaque and you'll think the water is moving! 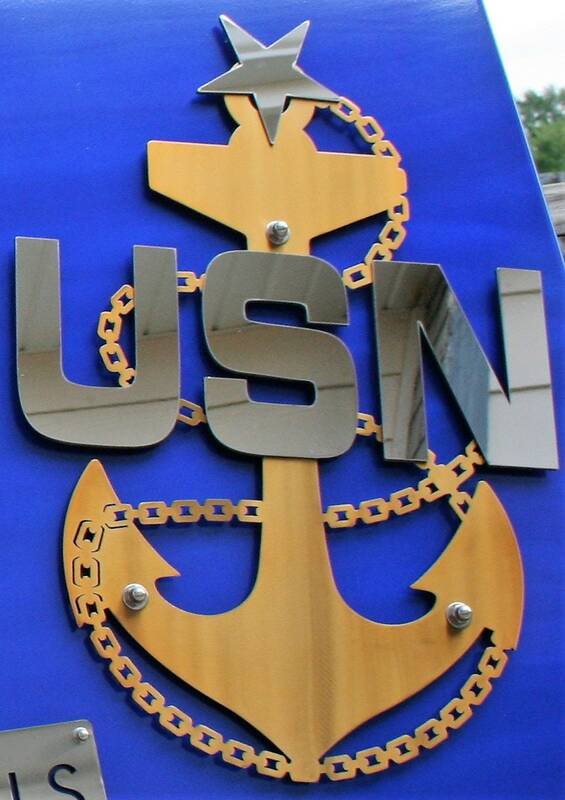 This beautiful Chief's Anchor is coated with translucent durable powder coat. 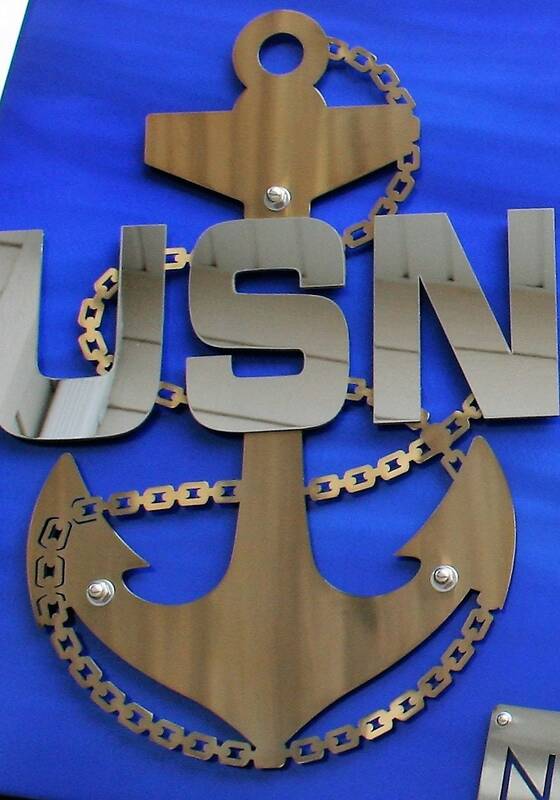 The USN stands out in mirror finish stainless, and the anchor is translucent gold. The fine crafted sign commands attention in any room. Choose the anchor with or without the flowing blue backing plate. 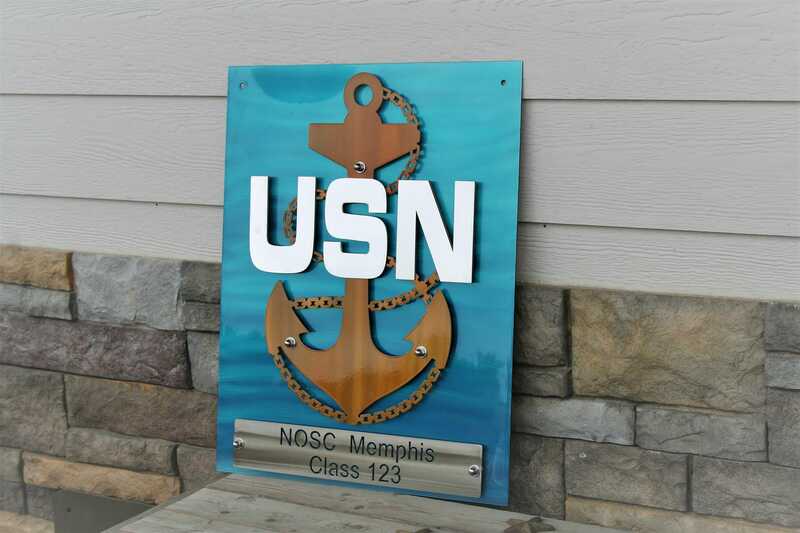 The thick aluminum backing plate can be customized with the Chief's name, rank, years of service or other message. Add stars for Senior or Master Chief at no additional charge. All pieces are 100% rust-proof! 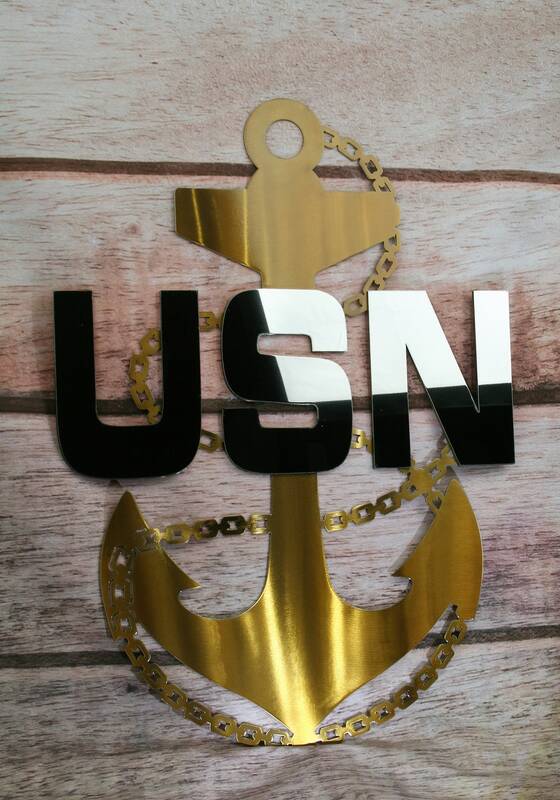 *Anchor Plaque & Name -- Anchor will be mounted onto blue stainless plaque with an additional clear stainless plate for name, rate, years served, retirement date, pinning date, etc. Be as creative as you like with this short message! 18" wide, 23" tall. 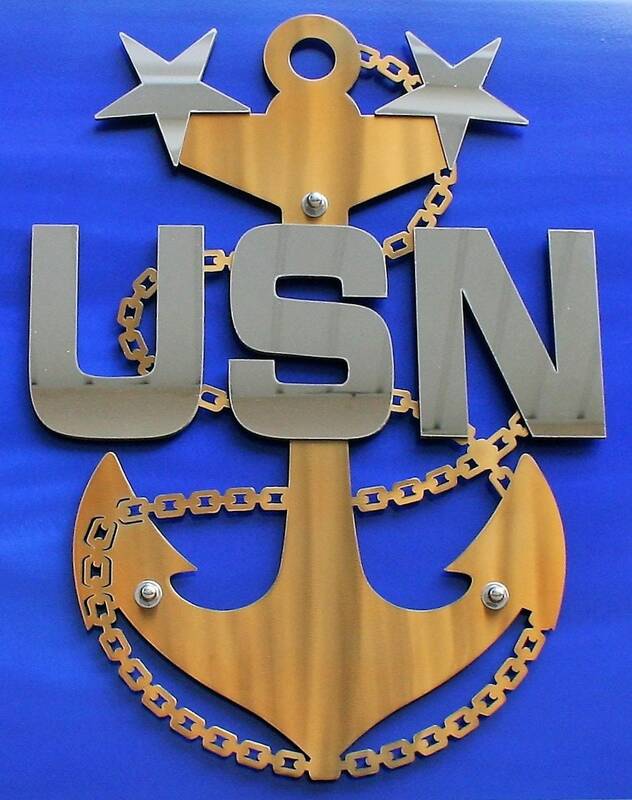 *Full Sign, 3 Anchors -- Full custom sign is 24x48" in size. One short line of text on the stainless plate can read with your class number, your NOSC name or any other message. If you'd like international shipping, please contact us for an estimate. Individual anchors are in stock and ready to ship. You can expect 1-2 weeks to process custom signs plus up to 6 business days for shipping. We can also add a 1x3" engraved brass plate to your individual anchor. The brass plate is a more affordable way to add rate, rank, retirement date, or any other message you'd like. Simply add the Anchor to your cart, then click here to add the engraved plate as well. 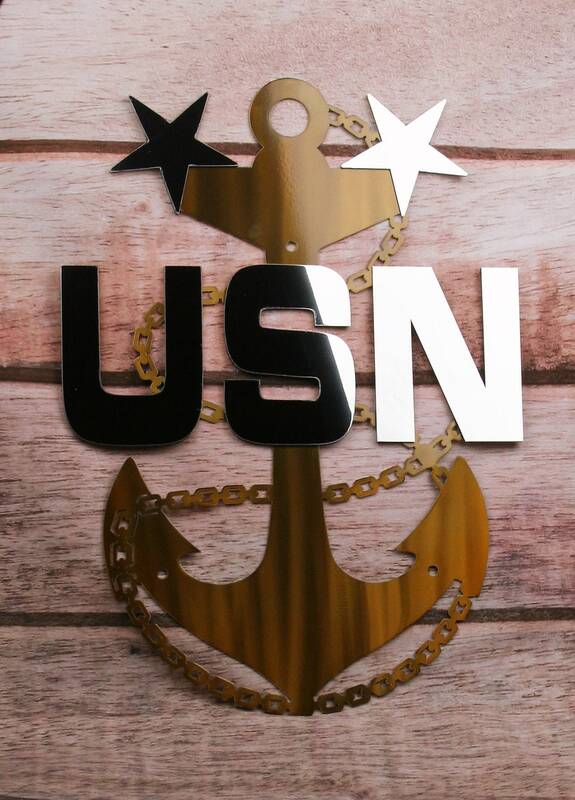 We hope you'll love our US Navy Metal Art. 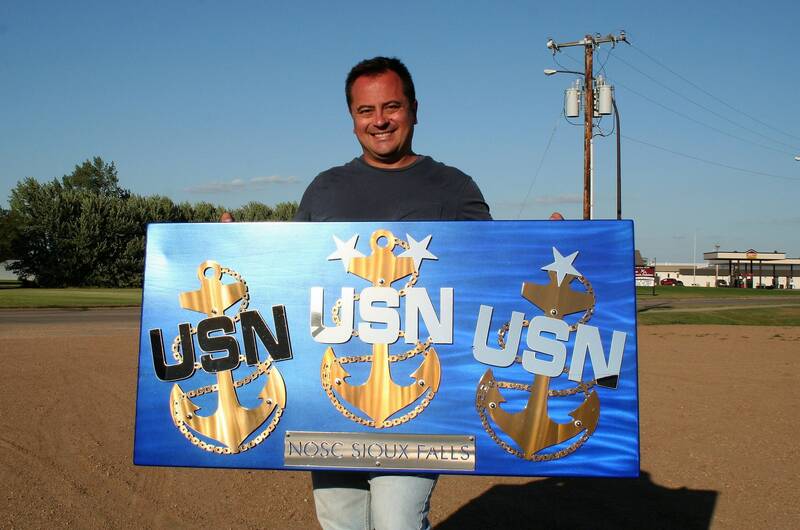 ETC Wiese is a member of the US Navy Reserves, and each Navy art piece is a labor of love for him. 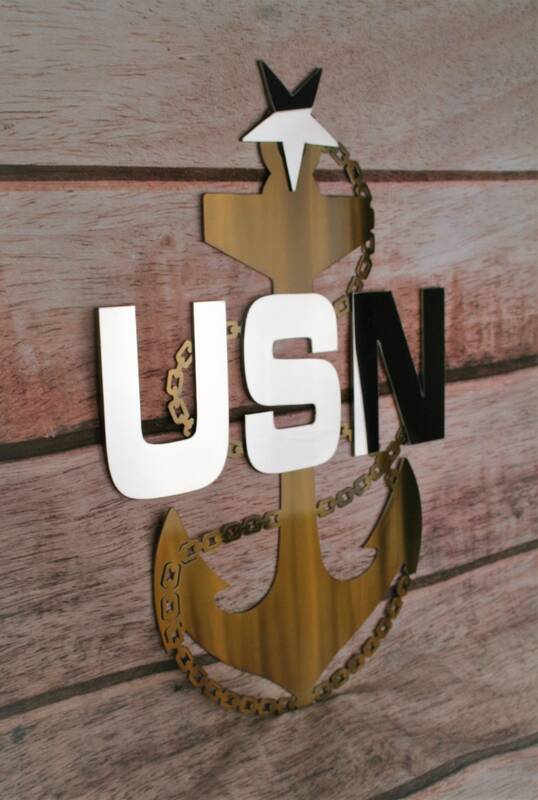 Our Navy Chief Anchors are 100% made in USA and made to last a lifetime! Purchased for a retirement gift. It looks amazing. Very clean cut design. On time shopping and no problems ordering. Best gift ever! Arrived to my home in Japan lightning fast! Packaged perfect. So much prettier in person. It's super heavy. I hung it with 3 3M 16 pound weight command strips just to be safe. I couldn't live this gift (for my husband) more. This is truly stunning in person. My husband is going to love this once I give it to him after his pinning ceremony. I also received it much more quickly than I thought I would. Very impressed and will likely order from this seller again in the future!